CENTRAL — After Catholic High’s pounding of highly-regarded Denham Springs 42-13 last Friday night, there is much talk of a resurgent Catholic, supposedly much improved over last year’s team that went 3-7, but Central coach Sid Edwards is having none of that talk. “It is a complete misconception. Catholic had a fine team last year that ran into some bad luck. They’re the same team this year, just one year older, bigger, and stronger. They are one of the finest teams we will ever face,” he said. The long-standing rivalry between Catholic and Central really was a one-sided mismatch for most of the past 60 years. Until four years ago, the record between the two teams was 41-1-1. Catholic had won 41 games, Central had won one, and there was a tie. Then four years ago, with Coach Sid at the helm, the dynamics changed completely. Under Coach Sid and former coach Doug Dotson, Central won the last four games from Catholic and four straight District 4-5A championships. To say that Catholic is looking for revenge is putting it mildly. Catholic High is bigger and stronger than Central man for man, and their speed is about equal. The Wildcats (3-0), ranked No. 13 in the state, will only be able to beat Catholic (2-0), ranked No. 12, if they dig deep and find something inside. Catholic High fans will do their part to help the Bears. They travel with 2,000 to 3,000 fans and quickly sold out the 750 tickets they were allotted this week. If Central fans don’t show up at Wildcat Stadium early, the Bears will take over the Central side of the field. In last Friday’s 57-34 victory over Woodlawn, Central showed many bright spots. Lamonte Janeau rushed for 168 yards and scored four touchdowns. Gary Triplett started the night strong with six carries for 82 yards before suffering a sprained ankle early in the 2nd quarter. He could be out for the Catholic game. Justin Vessell had a dazzling 60 yard run. Quarterback Brett Courville was steady as usual. Tony Ragusa and Thomas Eddlemon were also bright spots. At this Friday’s game, Central and Catholic fans will be asked to contribute to help Kyle Hebert, former quarterback on Coach Sid’s state championship team at Redemptorist. Kyle, a Baton Rouge fireman, has a baby named Lawson who is suffering from a highly fatal disease that is destroying the family financially. There will be no parking at the church across from the stadium. Our rankings for District 4-5A after three games: 1. 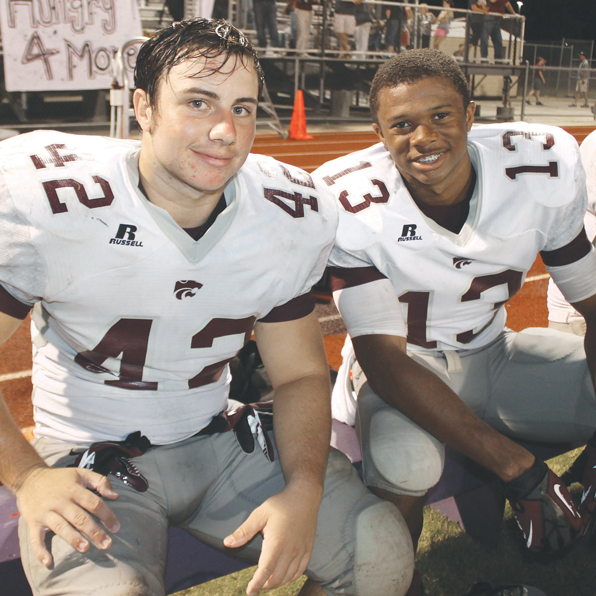 Central, 2-3 Denham and Zachary, 4. Scotlandville, 5. Live Oak, 6. Walker. Game of the Week: Without a doubt Catholic at Central. Better arrive early. Not kidding.